Hello, Hallmarkies! Welcome to the second Fall Harvest feature of the Hallmark Channel! This week’s romantic new movie is part three of the “All of My Heart” series called “All of My Heart: The Wedding” Yes, Brian and Jenny are finally getting married! But, it seems a distant relative arrives and changes things, not in a good way. 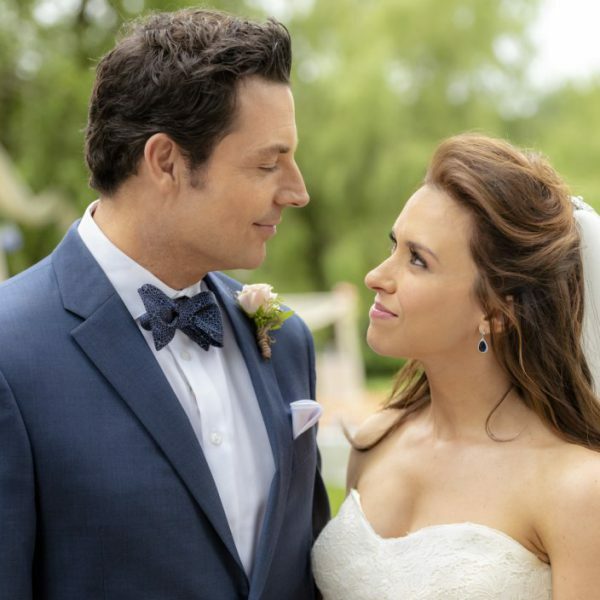 What will happen to Emily’s Country Inn where the wedding will take place? Can Brian and Jenny raise enough money to hang on to their country inn home? What will happen to their darling little goats? All of these questions will be answered when the movie premieres Saturday, September 29 at 9pm/8c. The movie stars Hallmark Channel fan favorites, Lacey Chabert and Brennan Elliot. It comes as no surprise that all turns out well. After all, it’s a Hallmark Movie where everything turns out, which is also why the movies are so popular and beloved. The movies take us away for a couple hours and lets us forget our sometimes challenging world. 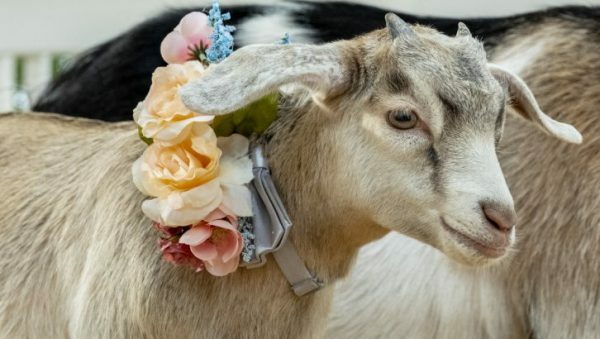 The wedding takes place and the cute little goats are part of the wedding. But, as I am going to do with every Hallmark Movie blog, is come up with a recipe that could tie into the movie. For this wedding movie, Jenny mentions that her dream wedding cake would have a chocolate ganache, a raspberry filling with white chocolate, and an Amaretto glaze. Whew! Sounds great, but no way I was going to attempt making a huge wedding cake! Instead, I went with the goats and came up with an elegant yet easy appetizer using goat cheese. 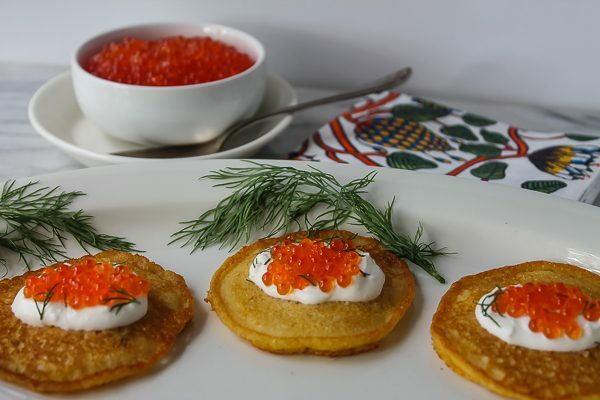 How does this sound: Cornmeal-Dill Blini with Goat Cheese and Smoked Trout Roe? Sounds fancy, yet they are so easy! 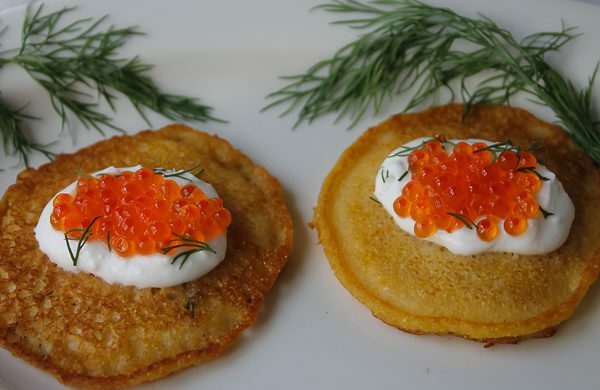 The little blini’s are tiny and thin savory pancakes with cornmeal and fresh dill. They mix together in minutes. They are then fried in a little oil which takes less than a minute to make! Then just top and serve with a dollop of goat cheese and the caviar. They are an easy, elegant, two bite appetizer. Don’t like caviar, you say? 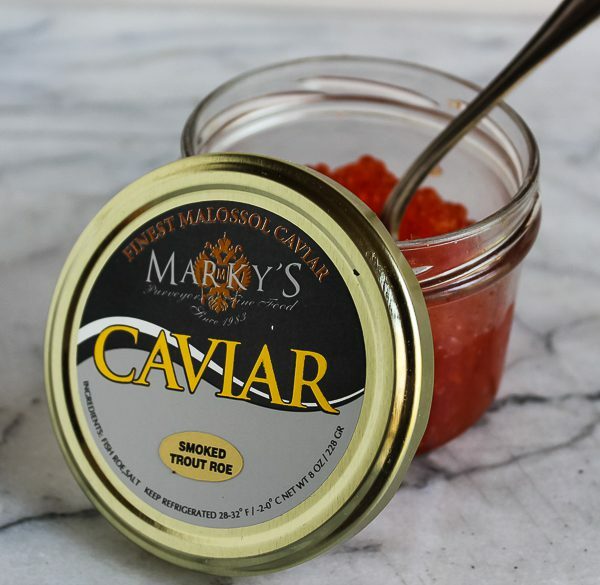 Well, I didn’t either until I tasted this amazing Smoked Trout Roe from Marky’s. You have to taste it to believe it. It’s nothing short of amazing! If you happen to not care for goat cheese, substitute sour cream. Or you can even stir a little sour cream into the goat cheese, which is what I did because my husband does not like goat cheese, but he didn’t even notice it when I mixed in some sour cream. Don’t forget to tune in Saturday, September 29th at 9pm/8C for this fun movie. Making the blini’s is optional! Heat oven to 250 degrees. Have ready a heatproof plate covered in paper towels to keep blini warm while making the full batch. For Blini: In a medium mixing bowl, stir together the cornmeal, flour, baking soda, salt, and dill. In a two- cup glass measuring cup, pour in the milk then add egg and whisk briefly to combine. Brush a large skillet with some vegetable oil; you don't want a lot of oil, but brush on more as needed for each batch. Using a 1 Tablespoon measuring spoon, scoop up the batter and quickly and carefully pour into hot pan make blini but do not have them touch so they keep their round shape. Flip over when bubbles evenly appear on top. The whole process takes less than a minute to cook each one. Transfer the cooked blini to the prepared lined plate and keep warm in the oven. Repeat using all the cornmeal batter. You will have about 2-1/2 dozen blini. 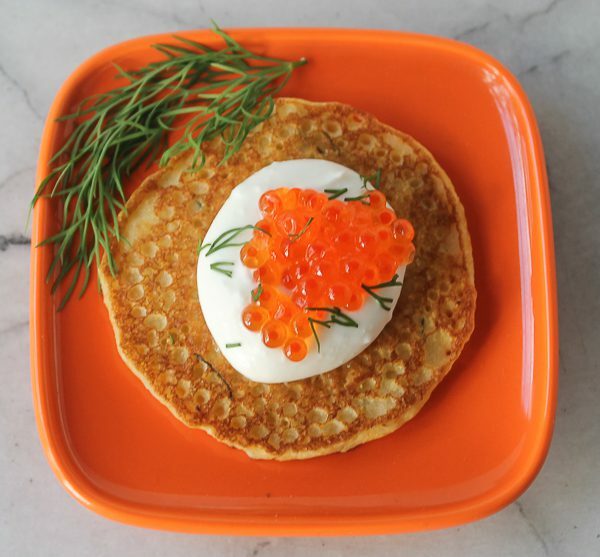 Place about 1 Tablespoon of goat cheese on top of each blini followed by about a teaspoon of caviar, and sprinkled with a little chopped dill or a tiny dill sprig. Serve immediately. We have a concert tomorrow night, so I will have to watch the wedding at a later date. I’m recording it, of course. I loved the first two movies in the series, so I expect to also love this one. Your accompanying recipe sounds delicious! I love all the components. I may have to try the smoked trout caviar. 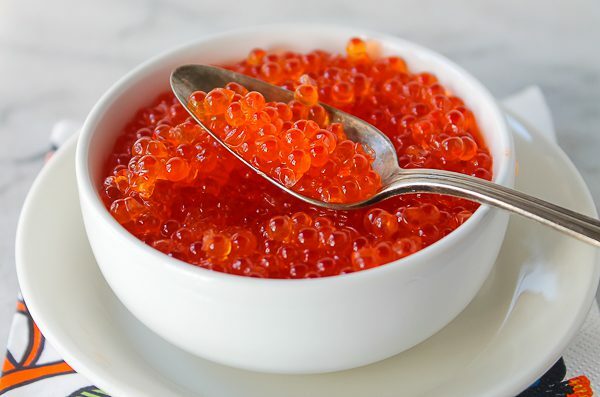 I always keep a jar of salmon caviar in the refrigerator, so I could use that. Madonna, salmon caviar would be great too! Enjoy the movie! I also love the Hallmark movies and the weddings are always dreams come true of course. BUT, dear Debbie, as a retired cake decorator, I would have loved to see your creation of that spectacular cake as you described above ….I think the goats would have loved that also. Just having a little fun at your expense. I’ll be watching this with you too. Thanks for a refreshing blog today. Elaine, I would have loved to see YOUR version of the wedding cake! Better than anything I could do for sure. You are the master!